This sea glass necklace serves as a reminder to embrace the sea of change in your life. Carla Garro combs Massachusetts' shores for sea glass—pastel treasures swept away by the ocean and then broken and tumbled smooth over time—for this sterling silver piece. The circular pattern reminds its wearer to embrace the sea of change in her life and to look forward to a bright future. Handmade in Massachusetts. The name of your company says it all. I love almost everything you represent and particularly that you are not common - often excellent. This was the perfect gift for my sister who's had a very rough year and I wanted to give her something meaningful. My sister is very pretty and delicate and likes pretty things. 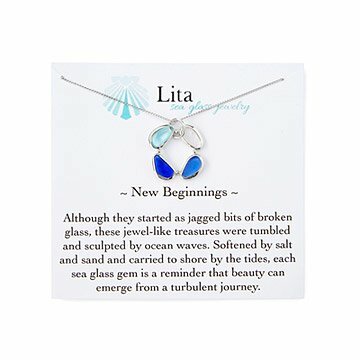 The name of this necklace, New Beginnings, summed up my hope for her, and the sea glass and artist are from one of my most frequented vacation spots. It is a beautiful necklace and very meaningful to my cousin. This was a gift for a friend. The sentiment on the card reinforced the special meaning. It was the perfect gift. I was very happy with the quality & presentation. I would definitely buy again. The package arrive in a lovely box with a ribbon. Inside was the necklace. It resembled 100% the image. Lovely and as described. I really like the meaning of the piece and the stones. My sister loved this beautiful necklace!. Very nice quality and delicate, including the chain. Perfect size for a small or medium build person.